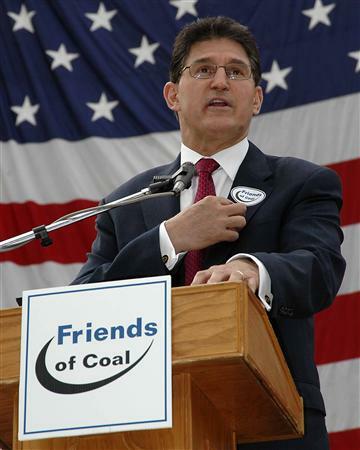 Sen. Manchin weak on the ‘war on coal’? Seriously? June 8, 2012 by Ken Ward Jr.
A nonprofit advocacy group is pledging to spend $1 million pressuring U.S. senators to oppose the Obama administration’s “War on Coal” ahead of a Senate vote on regulating utility emissions. The group, American Commitment, is starting a round of television, radio and Web ads in four states with potential swing votes on the Environmental Protection Agency’s utility MACT (“maximum achievable control technology,” for you regulation buffs) rules: Tennessee, West Virginia, New Hampshire and Maine. Two of the targets for the campaign are Tennessee Sen. Lamar Alexander, a Republican, and West Virginia Sen. Joe Manchin, a Democrat. The ads urge Alexander to “stand up for Tennessee” with his vote, and invoke legendary West Virginia Sen. Robert Byrd in urging Manchin to advocate against the Obama administration. No deliberate effort to do away with the coal industry could ever succeed in Washington because there is no available alternative energy supply that could immediately supplant the use of coal for base load power generation in America. That is a stubborn fact that vexes some in the environmental community, but it is reality. Byrd’s statement is still true today. Alternative energy is not ready for “prime time” generation. NG prices won’t remain this low forever. The future is higher energy costs along with higher unemployment in the Appalachian coalfields and the EPA is forcing the change prematurely. Anyway, what’s a million dollars, Bloomberg had $50 million to burn.